Annie, a uniquely American story about survival, pluck, second chances, generosity and triumph, opened at Steel River Playhouse this past Thursday. This Broadway sensation, ripped from the pages of a comic strip, won three Tony Awards. 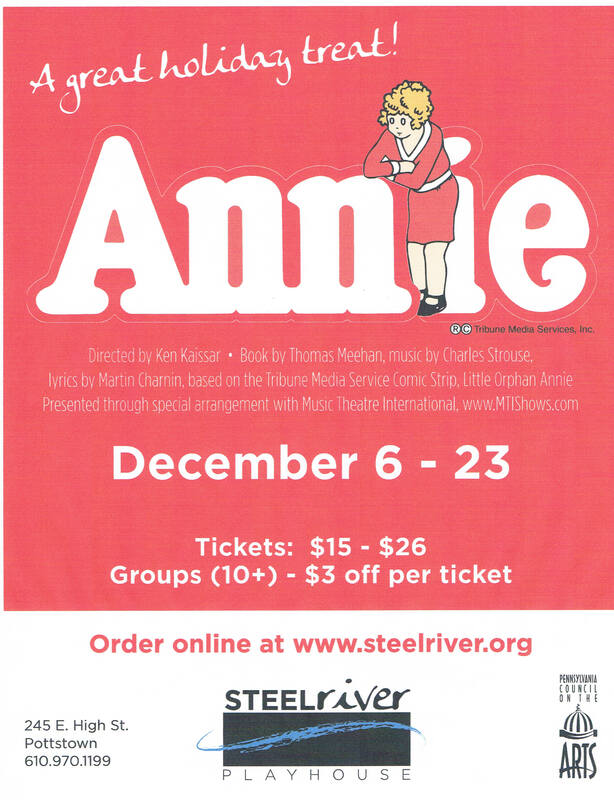 Annie is a spunky orphan with infectious, unbeatable optimism and moxie. She’s determined to find her parents, who abandoned her years ago on the doorstep of a New York City orphanage run by the cruel and bitter Miss Hannigan. She does escape, but is caught and returned, only to be selected as the needy child who’d stay at billionaire Daddy Warbucks’ mansion during the holidays. Shenanigans ensue, relationships grow, and even President Franklin D. Roosevelt and the Secret Service join the fray! *There will be no performance Saturday, Dec. 15. An added matinee performance will be held Dec. 22 at 3PM. Tickets for the 12/22 matinee may not be currently available due to a large group order, but please check back after Dec. 6 if this is your only available date . Special Event: Sunday, December 9 – Talkback with the director and cast. An opportunity for audience members to ask questions. The beautiful voices of our Annie cast will be complemented by our accomplished pit orchestra. At Steel River Playhouse, high-quality, live music is an important part of the musical experience. This Steel River Playhouse production is being directed by Ken Kaissar. His directing work has been seen in New York at The Culture Project, Manhattan Repertory Theatre, The American Globe Theatre, Theatre Row, and The Epiphany Theatre Company where he directed a production of the Ibsen classic, A Doll’s House. In March 2010, Ken directed Noises Off at Steel River Playhouse. An accomplished playwright, Ken was commissioned by Columbia University to adapt The Canterbury Tales to the stage. His ten-minute play Ceasefire (written in response to Israel’s war with Hezbollah in 2006) was an official selection in the 2012 New Works Festival at the Fusion Theatre Company; it also was a winner of the West Boca New Play Competition and a regional winner in the Kennedy Center American College Theatre Festival. An acting coach, working with up and coming talent in New York and Pennsylvania, Ken also teaches at Steel River Playhouse. Formerly Tri-County Performing Arts Center (Tri-PAC), Steel River Playhouse, a 501(c)(3) charitable organization, seeks to strengthen community, inspire creative exploration, educate, and entertain, through the presentation of quality performing arts events and education for diverse audiences. Each year, the Steel River Playhouse produces more than 90 performances and hosts more than 10,000 people as audiences, students, artists, donors and volunteers from throughout the region. We offer performance opportunities through open auditions; theater technical training; acting, voice, and instrumental lessons; classes and workshops for all ages; summer camp programs; and educational outreach including scholarships, artists in the classroom, traveling children’s shows, and other initiatives. 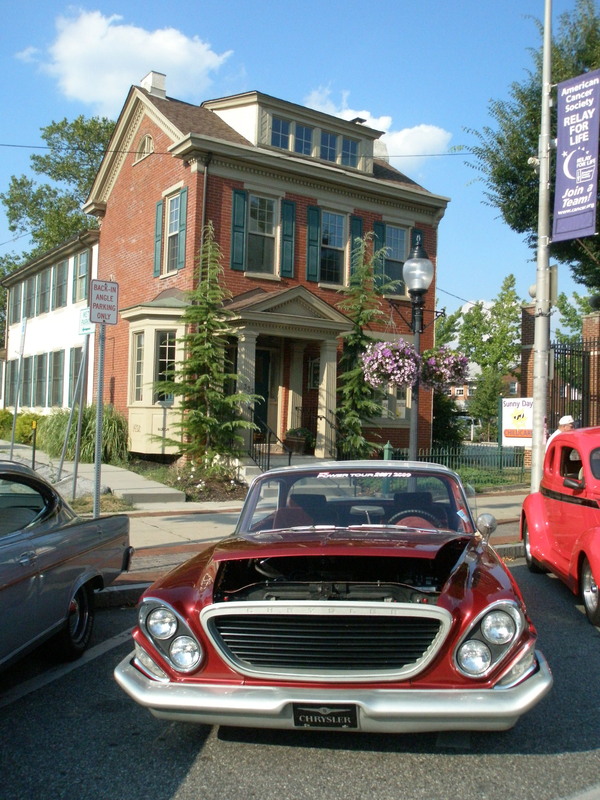 For further information, visit www.steelriver.org, or call 610-970-1199.